It would have been gratifying to have prolonged our stay at Side; the profusion of interesting objects which arrested the eye at every step, could only be considered as an index to the richer harvest that was likely to reward a more diligent search both above and under ground: but the great length of coast yet to be explored would admit of no unnecessary delay. April 10th. I this morning paid a visit of some hours to the ruins of Side, which were about a mile from the spot where my tent was pitched last night; they are far inferior in scale, date, and age to any I have before seen. Charles Fellows - Journal Written during an Excursion in Asia Minor in 1838. 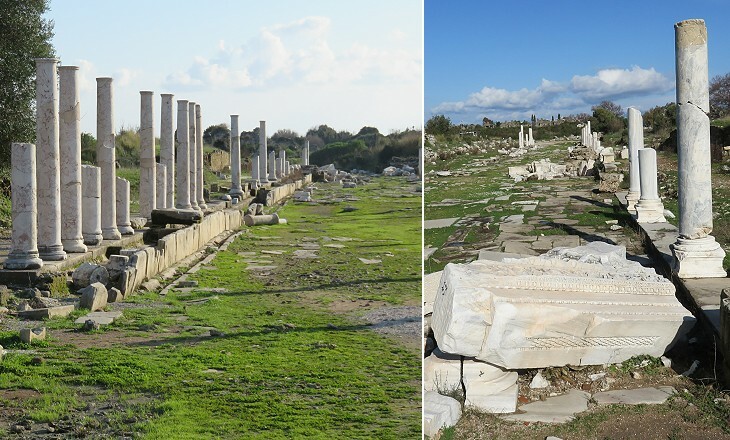 Fellows visited Side a few days after having seen Sagalassos, Perge and Aspendos. 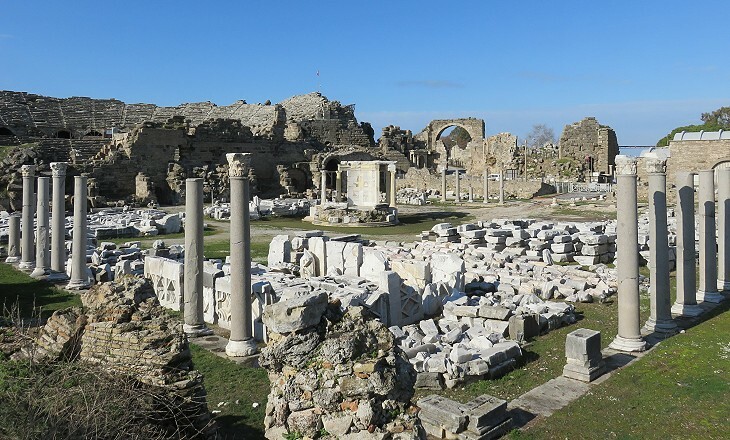 Similar to the agora of Perge, that of Side consisted of a large square surrounded by porticoes with a round temple at its centre. 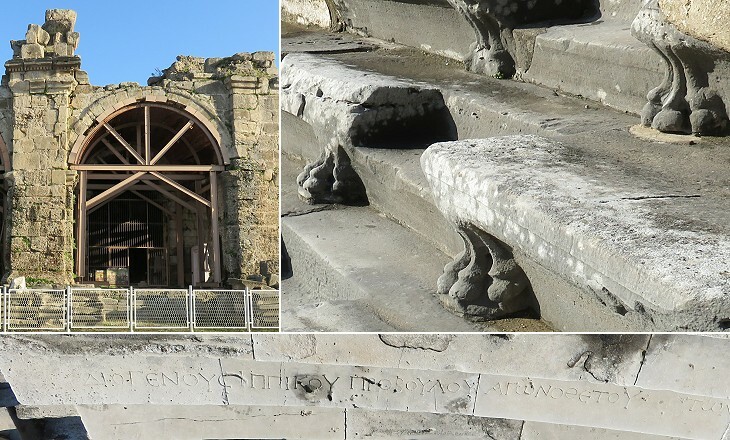 The latter is in the process of being reconstructed (you may wish to see the Commercial Agora in 2008 - it opens in another window). Another agora (State Agora) was situated at the south-eastern end of the Harbour Quarter. 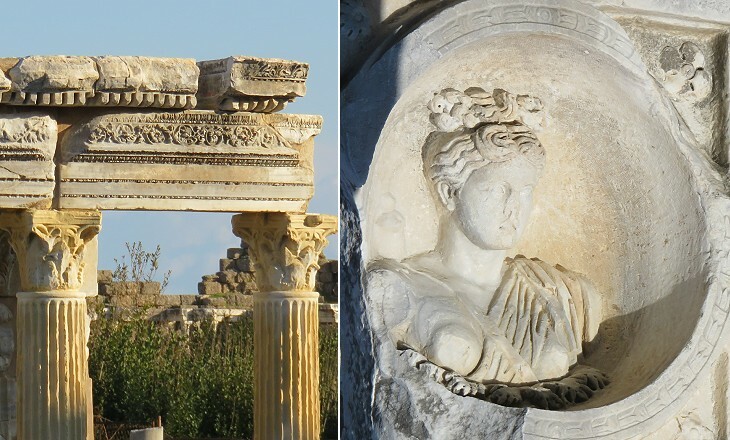 The circular building has been identified as a Temple to Tyche, a goddess who was regarded as a guardian of towns because she wore a crown resembling the walls of a town. She continued to be portrayed, if not worshipped, in Christian times (see a mosaic at Scythopolis, today's Bet She'an in Israel). The calculations made by Beaufort have been endorsed by archaeologists. 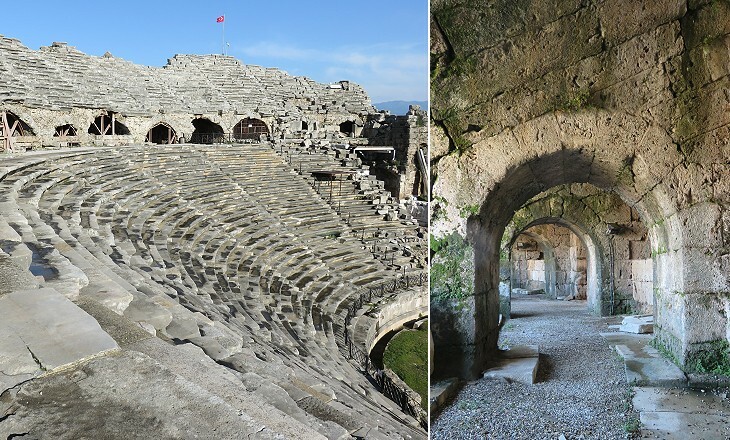 The cavea was divided into two sectors and it was supported by a system of arches which strengthened its resistance to earthquakes. 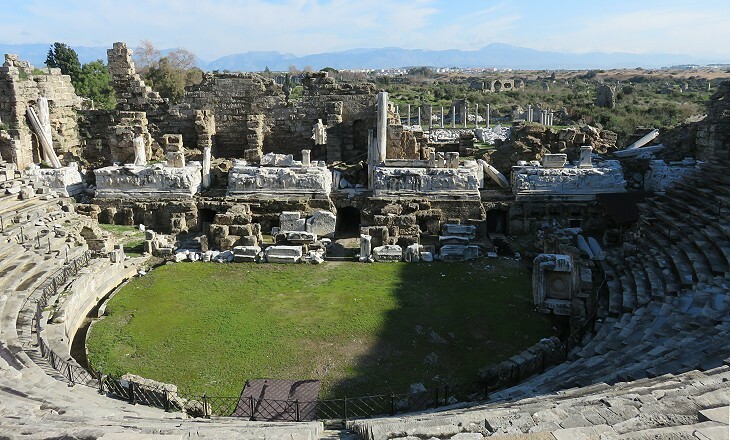 Scaenae frons, the building behind the stage, was a narrow and long construction and its stability was lesser than that of the cavea. Its collapse entailed that of its decorated portico. 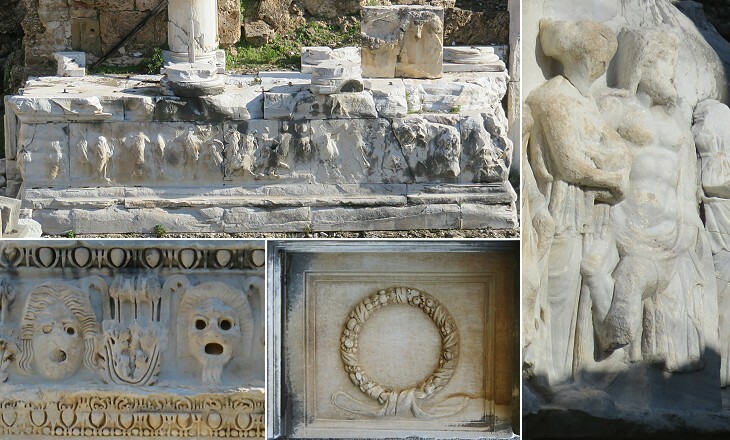 The damage to statues and reliefs was partly caused by the rage of the Early Christians towards symbols of the past religion, such as the Dionysiac scene depicted in a long relief on the stage podium. 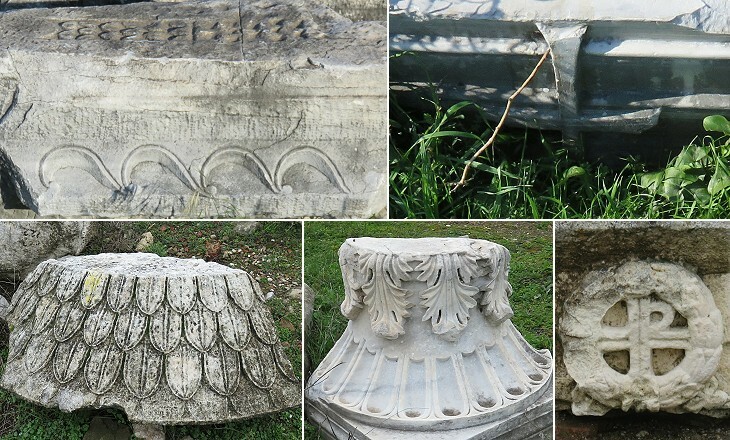 The main theatre of Athens was dedicated to Dionysus, the god of Drama and a small temple to him has been found near the entrance to the theatre of Side. 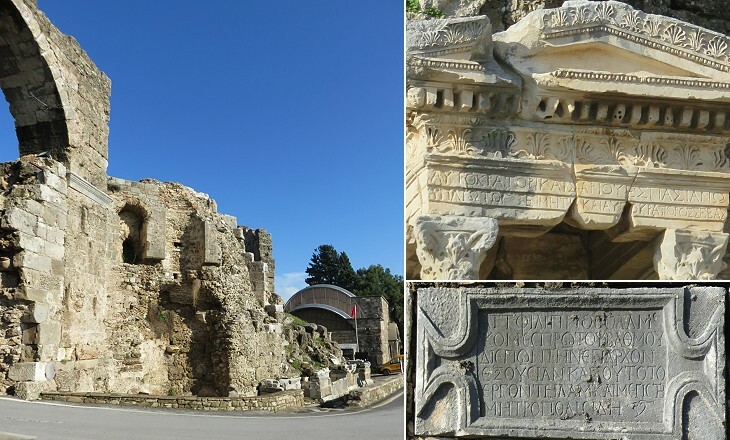 A triumphal arch erected at the side of the theatre and across the street leading from the land gate to the harbour was walled up in Byzantine times. Archaeologists have unearthed a small monument/fountain to Emperor Vespasian which had been incorporated into the new fortifications to the left of the arch. 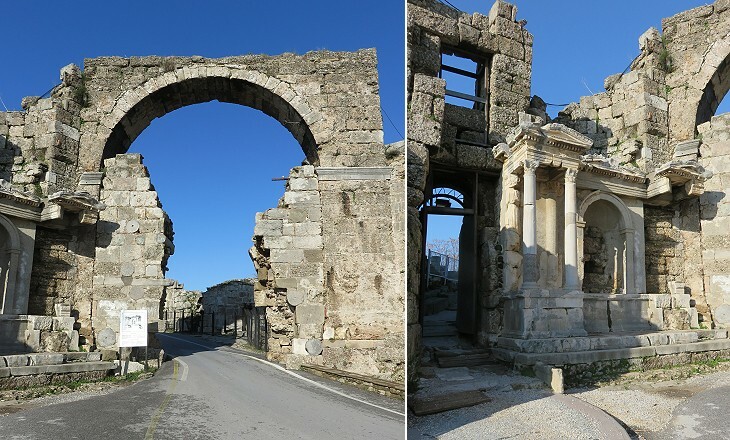 The street was flanked by the aqueduct which supplied water to large baths and to a nymphaeum with three niches. By and large inscriptions at Side were written in Greek. One of them indicated that the theatre had been turned into an open air Christian church. 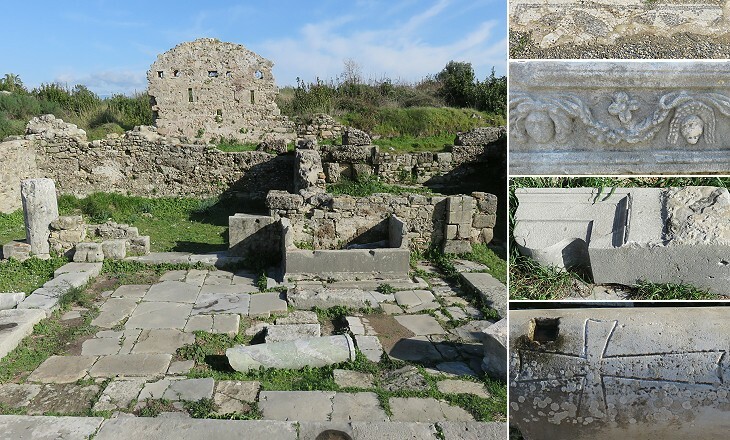 Archaeologists have uncovered a group of two storey houses near the Commercial Agora. They were relatively small in size, but they had access to the aqueduct and were decorated with floor mosaics and some reliefs. At Side, as well as in many other ancient towns, there is an imbalance between the size of the monuments and that of the quarters for ordinary people which have been unearthed by excavations. It could be that the poorer classes lived in mud and/or timber houses outside the walls which have entirely disappeared. The main colonnaded street crossed the whole town from the land gate to the harbour. Part of it is now under the houses built after 1895 when Side was repopulated with Muslim refugees from Crete and part is covered by a modern road. It was not the only colonnaded street of the town and archaeologists have in part reconstructed that which linked this street with the Eastern Gate. Move to 1. The Walls or to 2. The Harbour Quarter or to 4. The Archaeological Museum.